Plus, cacti double as the perfect weapon to protect yourself. The “jumping cholla cactus” would be particularly effective at this (although you might end up being the one injured, so beware). Anyways... Back in July, our Annuals buyer, Liane, and I had the opportunity to visit a few plant growers in California. And while Liane was busy searching for the nicest Calibrachoa in town, I was in hot pursuit of some cacti. To this end, we hit up the Good Earth Nursery, one of California’s premier cacti and succulent growers. Swansons has been getting plants from the Good Earth for years, and their selection and quality never disappoints. 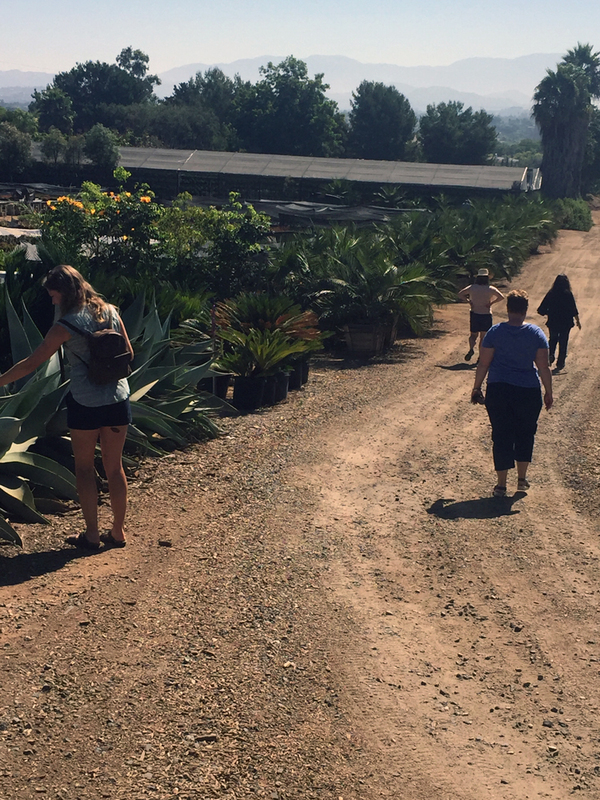 Me (left), wandering around a sea of cool succulents and cacti at Good Earth Nursery. Our annual’s buyer, Liane, with some really awesome calibrachoa (aka millionbells). The Good Earth is one of the best growers of my absolute favorite houseplant, a type of succulent called Haworthia. Haworthias are adorable, lower-light tolerant succulents that require very little maintenance and grow so slowly that you can keep them in the same tiny pot for years; perfect if you want a cute little potted plant to sit on an end table or in a terrarium. The Good Earth grows a number of varieties, my favorite of which is probably Haworthia ‘Miami.’ Getting to see a whole table chock full of Miamis was one of the highlights of our visit! 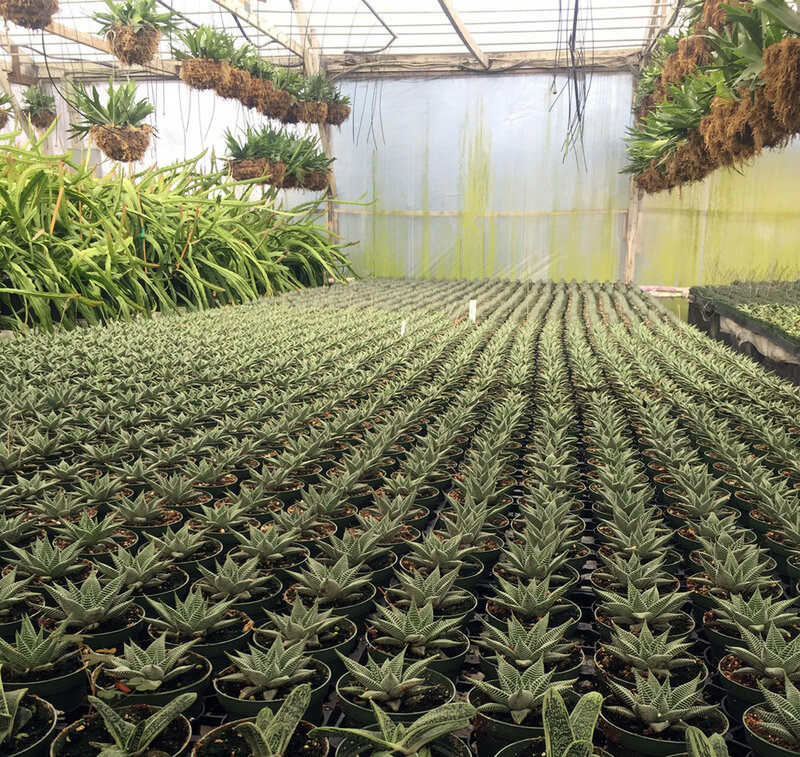 Haworthia 'Miami' as far as the eye can see. In addition to Haworthias, the Good Earth grows a number of my other favorite succulents. They had a lovely crop of Bird's Nest Sansevierias, which is a cute, more compact type of snake plant that is perfect for your desk at work. Sansevierias are probably the world’s easiest houseplant - the only way to kill them is to overwater them. They like to be nice and dry, and can survive in a wide variety of lighting conditions, from some direct sun to entirely florescent office lighting. Bird's Nest Snake Plants are great for your desk at work! Another of my favorites is the string of pearls, a type of Senecio that looks like a bunch of peas strung together. While not as easy to grow as Haworthia or Sansevieria, the string of pearls has a delicate beauty and makes a fabulous hanging plant for a sunny window. Seeing them en masse at the Good Earth was so cool! It made me want to fill my windows at home with hanging baskets, staggered at different heights. I would do this but my roommate has placed a moratorium on new houseplants, and while I don’t plan on obeying this rule, I have to choose my battles wisely. I’m holding out for a nice big cactus! Disclaimer: Euphorbia ingens is not actually a true cactus, but a type of succulent. To the untrained eye, however, it sure looks like a cactus. Plus, part of the reason that Euphorbia ingens makes such a good houseplant is precisely because it is not a cactus. Cacti need full sun, and to say that their growth rate is glacial would be an understatement. This is not to say that these Euphorbias grow quickly and don’t need lots of light: they grow slowly and need very bright light. However they can survive in or near a sunny window in our Seattle apartments, and over many years may get so tall they hit the ceiling and need to be pruned back. Pruning is easy to do, you basically just cut off whatever part is too tall, and it will sprout out new growth from below where you cut it. Plus you can easily root the cuttings, which is exactly how these plants are propagated by growers—hence the sea of pallets covered with disembodied euphorbia limbs. As our tour guide explained, these cuttings were in the process of callousing over. Once they had developed nice thick callouses where they had been cut, they would be transplanted into pots and allowed to send out new roots. Cuttings of Euphorbia ingens curing on pallets at the Good Earth Nursery. Obviously, my next question for our tour guide was “when will these plants be ready, and can I have all of them?” She replied that these wouldn’t be ready for some time, but she had a nice crop that would be ready for sale in a few weeks, and I could have some of them. I was very excited. A giant Euphorbia ingens, like the ones Good Earth uses to harvest cuttings. We recently received our big fat order of Euphorbia ingens and as soon as they were unwrapped, I set to work on a very important task: deciding which one would look best in my living room. I chose one with lots of branches and the coolest shape, bought him, took him home, and christened him Eugene the Euphorbia. Don’t worry, even though Eugene is mine and you can’t have him, there are still lots and lots of other really cool ones here at Swansons waiting for you to adopt! Eugene the Euphorbia looking very cool in my living room along with a wooden giraffe head and woven wall hanger from our gift shop! Plus my cat, busy plotting his attack. Luckily I think Eugene can defend himself. If you want a "Eugene" of your own, act fast, because although I found some amazing cacti on this trip, they are going to disappear quickly. One of our houseplant gurus, Heather, and me. We're really excited with the new Euphorbia ingens we have for sale. Look at all the cool cacti and succulents we have!